The Diplomats are not the only hip-hop group to form out of New York City. The LOX, consisting of rappers Jadakiss, Styles P, and Sleek Louch, formed in 1994 and took the industry by storm when Sean “Puff Daddy” Combs signed the group to Bad Boy Records after listening to their demo tape. 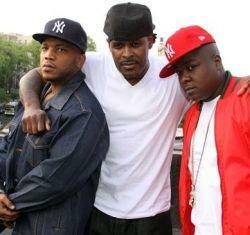 Since forming, The LOX have released two studio-albums along with other projects. Their debut 1998 album “Money, Power & Respect” certified Platinum in the US, as did their second album “We Are the Streets”. Over the course of the The LOX’s career, the group has collaborated with many notable artists including the legendary Notorious B.I.G., DMX, Lil’ Kim, Puff Daddy, Kelly Price, Carl Thomas, Eve, Mary J. Blige, Mariah Carey, Mase, and Jay-Z. The group has also collaborated with big-time producers such as Swizz Beats, Timbaland, Alchemist, and DJ Premier. The LOX had not dropped a project since their second album in 2000 until they surprised the hip-hop world by dropping a four-track EP titled “The Trinity” in December 2013. The group announced that they are hoping to drop an album in 2014. Until they announce specifics, stay posted for track releases, as they have dropped a few songs since releasing “The Trinity”. The group has been the subject of rumors regarding a possible deal with Rick Ross’ Maybach Music Group, but nothing has been confirmed. Each member of The LOX was featured several times on Wu Block, a 2012 album that was officially listed as a collaborative album by Ghostface Killah and Sheek Louch. They founded their own label in 2003 called D-Block Records. They were originally called “The Bomb Squad”, then changed to “The Warlocks”, and eventually settled on “The LOX” at the request of Sean Combs. The LOX stands for Living Off eXperience. The Lox Release Their First Album In 16 Years “Filthy America…It's Beautiful"